CX (AT104) is a 3rd generation of Software defined Indoor Unit. 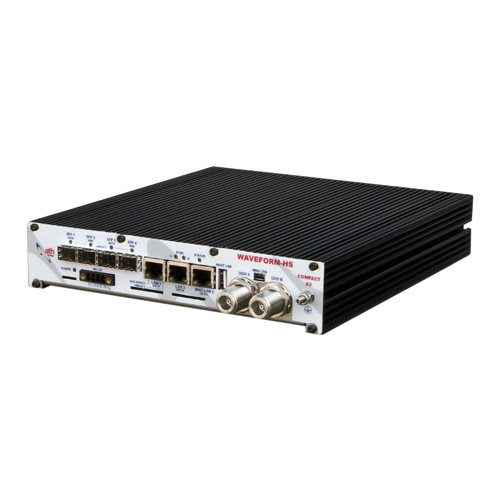 It is a robust and versatile IDU designed for High Capacity, point-to-point microwave networks. The modem unit is available in two basic modifications – single carrier version** and dual carrier version. The dual carrier modem version that has two integrated modems in one Indoor Unit delivers the excellent ability to connect two active ODUs and aggregate or switch the traffic between two links. The IDU is compatible with all major third-party ODU´s manufactures and allows to build complete wireless links in protective (Hitless 1+1 HSB, SD, FD), aggregate (2+0), non-redundant (1+0) and “Dual end station” configurations. The IDU is designed to address universal applications not only on Ethernet platform but also allows building of Hybrid systems. That means that the user can scale the pure IP radio system with additional interfaces (e.g. DVB-ASI ports for HD video broadcasting and E1/T1 ports for TDM applications) when the service is requested at the optimal costs. Thanks to its unique architecture and license keys the IDU is fully scalable and allows a seamless upgrade of transmission capacity and unlock or implement the additional functionality when the service is requested. CX (AT104) IDU is ready for branding and customization to OEM customers.